History will look back at 2018 as an inflection point in the trajectory of the University of Utah. Ruth Watkins was appointed and inaugurated as the 16th president of the university and the first woman president in its 168-year history. Two new Senior Vice Presidents also came onboard: Daniel Reed from Iowa as SVP for Academic Affairs, and Michael Good from Florida as SVP for Health Sciences. While the newsreels often focus on leadership changes, the real work, the real impact continues to be made by faculty and staff across the entire university. The deans of our U of U Health schools and colleges have each provided a short “2018 Year in Review.” Each one captures a few of the highlights of the impressive momentum and energy of accomplishment that permeates the University of Utah. For the College of Nursing (CON), 2018 was a year of progress and change. We saw many gains through the efforts of dedicated faculty, staff, and students. I hope you enjoy reading a few highlights of our success. 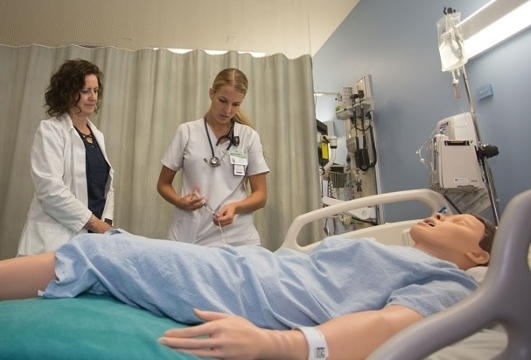 College administrators and faculty completed the first year of Nursing Organizational Leadership, a new post-master’s certificate and specialty track in the Doctor of Nursing Practice program. The Gerontology Interdisciplinary Program (GIP) received the Association for Gerontology in Higher Education’s Program of Merit designation at the master’s degree level. In addition, the GIP implemented an undergraduate minor and is the first completely online undergraduate minor available at the University of Utah. The 2018 research grant award portfolio for the CON was $31 million—with a 30 percent success rate in securing extramural funding. 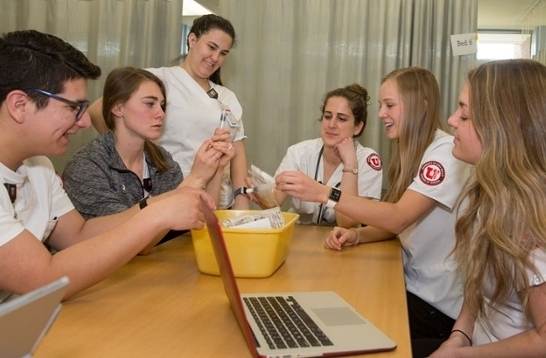 The college was ranked 23rd among 800 schools of nursing in NIH funding. CON faculty have nearly doubled the number of grant applications submitted since Fiscal Year (FY) 2016. Submissions increased by seven percent in FY 2018 (n=62) compared with FY 2017 (n=58) and 82 percent compared to FY 2016 (n=34). CON research partnerships continued to grow and strengthen in 2018. In many cases, we assembled stakeholders through grant-funded research and education efforts. For example, Deanna Kepka, PhD, MPH, played a pivotal role in organizing the highly successful Intermountain West HPV Coalition, an advocacy group that engages care providers from Mexico to Canada. In February, Dr. Kepka traveled to the Dominican Republic for a National Day on Women’s Health Conference at the invitation of First Lady Candida Montilla de Medina. Linda Edelman, PhD, MPhil, RN, led training to establish a statewide coalition of community and health care organizations with the aim to improve care for elderly patients (Utah Geriatric Education Consortium). The training was funded by the Health Resources and Services Administration. Over the past five years, the CON faculty practice has seen nearly 38 percent growth in operating revenue, from $3.7 million to more than $5.28 million in FY 2018. Three primary areas of revenue generation include a Juvenile Justice Services (JJS) contract, clinical contracts (both internal and external to U of U Health), and BirthCare HealthCare (BCHC). In 2018, CON nurses and nurse practitioners provided 22,197 clinical visits, 523 physical exams, 718 psychiatric exams, and 1,775 screenings for sexually transmitted infections (STIs) to incarcerated youth through the JJS partnership. BCHC providers conducted 11,797 outpatient clinic visits and attended 547 births at University Hospital. These numbers represent a 17.3 percent increase in outpatient visits. The majority of this growth was in new gynecologic patients, a 64 percent increase over the previous year. Jennifer Clifton, DNP, FNP, CNE, executive director for Nurse Practitioner Education, was selected as the American Association of Nurse Practitioners liaison to the National Commission on Correctional Health Care (NCCHC) Board of Directors. This is the first time any advanced practice nurse has held a position on the NCCHC Board. The American Association of Colleges of Nursing’s (AACN) awarded CON the first ever New Era Award in late 2017. The award is presented to the nursing education institution most integrated into a related health care system. We also received the AACN’s Exemplary Academic-Practice Partnership Award (2018) in recognition for our successful long-term partnership with JJS. In September, we bid a fond retirement farewell to Dean Patricia Morton, PhD, RN, ACNP-BC, FAAN. As we look to 2019 and beyond, we anticipate the same continued upward progress that we experienced under Dr. Morton’s leadership. Stay tuned for great things from the College of Nursing! 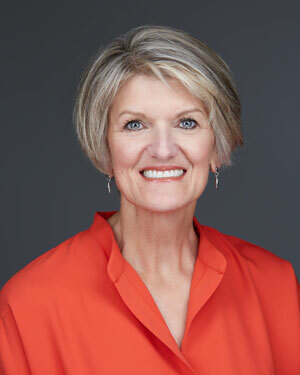 Guest blogger Barbara Wilson is the interim Dean of the College of Nursing. She is also associate dean for Academic Programs. Wilson’s professional background includes various clinical and administrative roles in the acute-care setting, primarily in women’s and newborn services.